I’ve been writing stories for myself since I read my first romance novel at age 12, but it wasn’t until my husband picked up one of my stories about 15 years ago that I started to think about publication. It’s been a long process of learning the craft interspersed with raising three children to get me to where I am now, lol! I’m currently writing dark urban fantasy (with romantic elements, of course), and I love the idea of making the supernatural ‘real’. There’s so much potential conflict for characters who suddenly discover that angels and Heaven and Hell actually exist, and I love exploring their reactions to the knowledge…and to what happens next. Dinner. I love getting caught up on what happened in my husband’s day, and I love that feeling of the day slowing down. Ooh. Good question. I’m not sure I actually have a favorite, to be honest. If I’m working with a strong, well fleshed-out character, it doesn’t really matter if it’s a male or female, or even if it’s a hero or villain. All of them have such an integral role in the story, and all of them present their own challenges. I think that’s what I really like…the challenge. I don’t have nearly enough hours to devote to reading these days, but yes. I’ve always been an avid reader. I’m not picky about genre, though. I’m more interested in a good story than I am a particular shelf in the bookstore, so I read quite eclectically. Right now I would be green, because it’s the end of January here and I would really, really like to see that color again…soon! I’m currently working on the fourth and final book in the Grigori Legacy series—tentatively entitled Sins of the Warrior. No pub date yet, sorry! 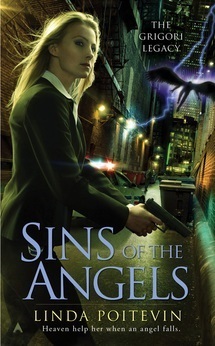 BE SURE TO COME BACK to read more about Linda and her release, SINS OF THE ANGELS, on Wednesday’s Karen’s Killer Book Bench!! Happy Reading! 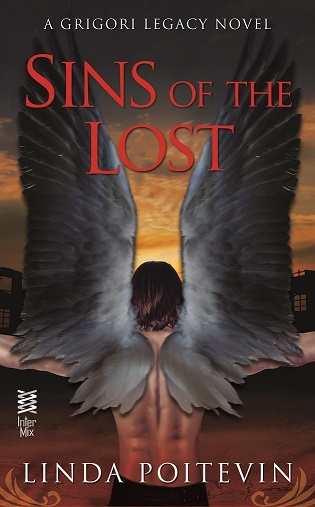 **SPECIAL ANNOUNCEMENT: Linda will give away a signed copy of her book, SINS OF THE ANGELS (available to a winner in Canada or the U.S.) to one of her lucky readers who comments on her Monday Interview or Wednesday Book Bench blogs!! Don’t miss this chance to read this story!! Thanks, Linda, for sharing your stories with us! Great interview. 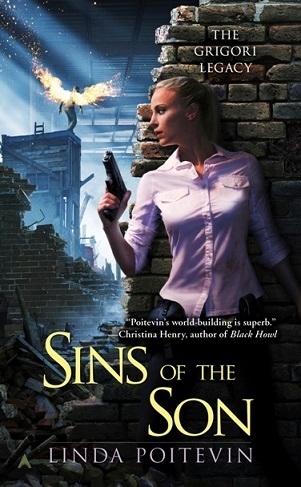 I’d never heard of your books before, but the cover of Sins of the Angels, as well as the title, really caught my attention. I am adding this to my TBR list and I can’t wait to read it, and the rest in this series. Oh, my fav part of writing is the plotting in my head part as well. I catch myself LOL’ing at some on the convos my characters have in my head before I put them on paper. I love the new questions! And I agree- we need to see more green RIGHT NOW! Love the description of your dream writing space. I’d agree to all of that, but set the house in Maine. I don’t live there, but love the state. I’ve already FBed this and I’ll tweet, too.